A congestion charge would reduce traffic congestion levels and improve air quality for local communities while raising money for public transport improvements. The scheme would help ensure there are no more airport related vehicles on the road with a third runway than there are today. Heathrow has made a commitment to increase the proportion of passengers who use public transport to access the airport from 40% today to more than 50% by 2030. A charge would provide a simple mechanism for managing demand and would future-proof Heathrow’s ability to meet air quality limits and minimise traffic on local roads in a wide range of possible scenarios. Major new public transport schemes are due to be delivered in the next few years. Crossrail will connect the airport to the City and East London; a Piccadilly Line upgrade will provide improved frequency and faster journey times for London Underground passengers; Western Rail Access will provide fast direct access to Heathrow for passengers from Slough, Reading and the Thames Valley as well as improve journey times to the South West and South Wales; Southern Rail Access would provide a new direct connection to south-west London and improve journey times to the south coast. High Speed 2 will connect Heathrow via Old Oak Common to the Midlands and the North. A congestion charge would help to discourage drop off and pick up and would apply only for those travelling to the airport – not to surrounding roads like the A30, A4, M4 or M25. Heathrow envisages that there could be exemptions in place for the greenest vehicles, taxis and for local residents, although this would be subject to future consultation. Funds could be ring-fenced to contribute towards major rail, London Underground and road improvements, as well as pay for further sustainable travel initiatives, public transport schemes and community transport improvements. Vehicles travelling to the airport will be cleaner in future as planned vehicle emissions standards come into force over the next few years. Combined with new aircraft technology this means that levels of nitrogen dioxide (NO2) would be within EU limits with a third runway. Levels of fine particles (PM10 and PM2.5) are already within EU limits around the airport and will remain so with a third runway. 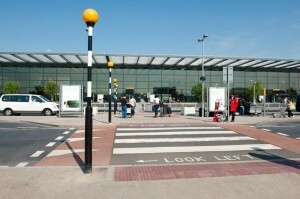 Heathrow operates a clean vehicles programme to promote low and zero emissions vehicles among airport companies. The airport also hosts the UK’s first publicly accessible hydrogen refuelling site and is increasing the number of electric vehicle charging points at its passenger car parks. We have pioneered the use of electric passenger rapid transit (PRT) pods instead of buses between Terminal 5 and its business car park. We also operate the world’s largest car sharing scheme and have an award-winning cycle hub for employees. The UK Government is forecasting a significant increase in alternatively powered vehicles, like electric cars in the years ahead.